Basaran Grinding Oil is a 100% pure synthetic fluid made from base fluids called PAO’s (Poly-Alpha-Olefins). PAO’ s are synthetically produced by combining a mixture of gasses with a catalyst, under heat and pressure, to form a liquid. It is the purest form of a liquid in the world due to its molecular structure. It does not contain any unwanted molecular chains like paraffin’s, sulfur etc. usually found in refined mineral-based oils, which come from crude oil. Uneven molecular chains, (paraffin’s sulfur etc.) found in all mineral based fluids, even after double and triple refining, break down during high heat and pressure which are associated with the grinding process. This creates the gradual deterioration of these fluids (carbide leaching) causing the need for periodic fluid changes. PAO based synthetics offer a flawless molecular composition made up of extremely ridged, evenly bonded molecular chains that are not affected by any elements of the grinding process. This allows an unlimited life span providing the fluid is filtered properly. Basaran Grinding Oil offers a lubricity factor five times higher than mineral based fluids and ten times higher than water emulsions. An evaporation rate 60% less than a mineral based product. 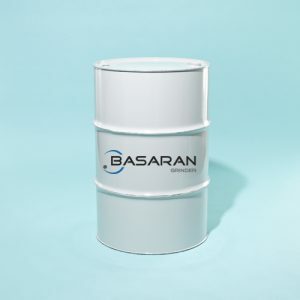 Basaran Grinding Oil was developed in Europe for use with all filtering systems. It is recommended by most Hi-Speed grinder manufactured both in Europe and the US and used in their showrooms and test facilities. 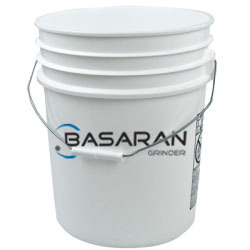 Basaran Grinding Oil was designed for all grinding applications, especially grinding of tungsten carbide. Flute grinding, external grinding, profile grinding, grinding of saw blades, grinding of inserts, grinding of aeronautical, medical parts and wear parts can easily be carried out with Basaran Grinding Oil. Tungsten carbide, HSS, steel, PCD, CBN, cermets, ceramics. Also, other materials have been successfully machined with Basaran Grinding Oil. Please contact our technical department for more information.